Everyone wants his or her website to be up-to-date. Online technologies develop so fast that you need a lot of attention to follow them. Making relevant adjustments to your website is always important, as it keeps you in trend and attracts more users. 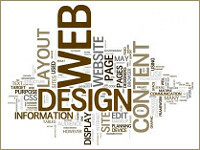 So, in this article we’ll give you a list of most important web design trends of 2012. And get ready – we’ve prepared many interesting points for you. This is one of the most notable trends of this year. Responsive interface identifies the devices of your site visitors, and selects relevant screen width. This is extremely important nowadays. The number of people using mobile devices for Internet grows with immense speed, so satisfying this users group will reward you a lot. If you use WordPress, you will easily find many free and paid themes that use responsive interface. To continue the topic of mobile devices, we should also speak about touch screens.The popularity of Android, Apple iPhone and Apple iPad devices proves that touch screens are now popular even among regular mobile users. No wonder this function makes a mobile device extremely easy to use. So, the trends show that it’s better to create a separate mobile version for your website. This lets your touchscreen users browse easier. Should you work with a blog or any other type of website, you have to consider sticky lines. This is one of the newest web design trends, and recently it’s started to develop very fast. Now even Facebook uses it. Sticky stripes let you allocate the most important controls of the site, and make them visible all the time, even if the page is scrolled down. Another interesting thing about these modules is that you can add social media links to them. This will not only make the site more interactive, but also foster its promotion. You can find different types of sticky stripes on the web — even some vertical ones allocated aside the text. Also, it’s worth saying that this trend is specially important for blog designers, as these sites often have post pages with long scrolls, and many users get bored while scrolling up and down. Get Ready for HTML5 and CSS3!